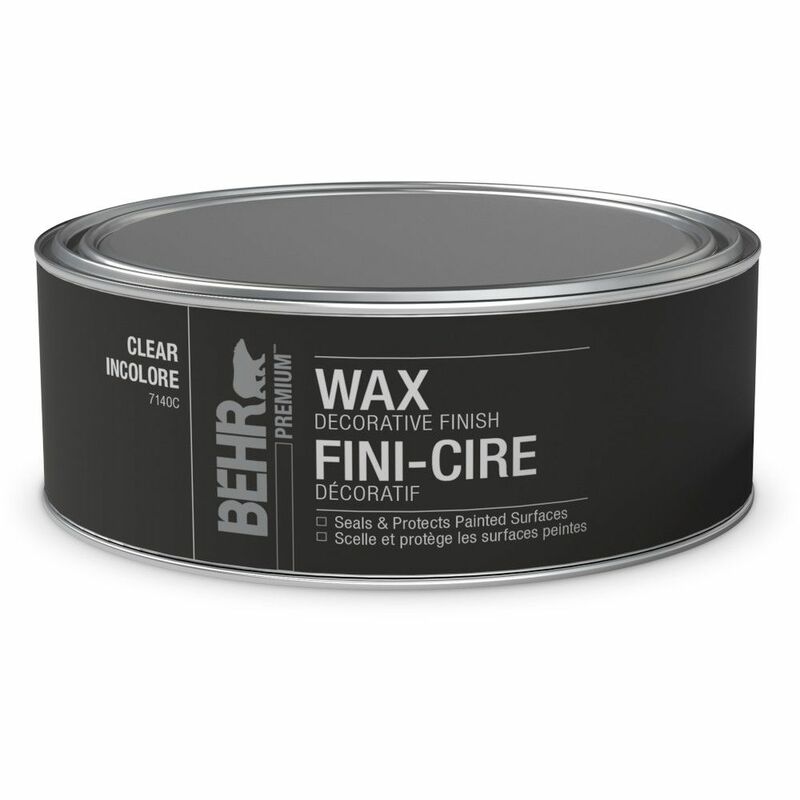 Decorative Clear Finish Wax for Chalk Paint Designed to work with BEHR Chalk Decorative Paint, BEHR Wax Decorative Finish is designed to seal and protect your painted surface. It is soft, pliable, low-odour, and easy to work with. It also buffs easily, allowing maximum control over lustre. Decorative Clear Finish Wax for Chalk Paint is rated 3.4 out of 5 by 7. Rated 1 out of 5 by LA NY from Wax was removed after one wash I used farm white and black wax this weekend on my kitchen table and my coffee table. The kitchen table looks stunning. After using it for breakfast this morning I washed down the table and all of the wax was washing away with just water and and a paper towel. This should be stated somewhere very bold on the product. I would have never used this on a kitchen table that needs to be washed daily due to use. I feel like I now lost two major pieces of furniture in my home that my family uses. Please help. Rated 5 out of 5 by retired2 from I'm sold on Behr - - - once again! I found the Behr Wax finish in the Home Depot after hearing about it on-line. Doing some crafting projects and thought I would give this finish a try instead of defaulting to the usual liquid stain after the initial paint etc. Although this product wasn't used over Behr Chalk paint, it worked over other Behr paint. And work it did! I will definitely use it again and again. Loved the patina that it produced with buffing. SOLD!!!!!!!! Rated 5 out of 5 by ArtistMommy from Worked Great! I am die hard fan of another brand of chalk paint and wax, and have faithfully used it since 1997 when I painted by first armoire. But, when this product line came out I had to try it. First, it is so much easier to get because it's available at Home Depot and I don't have to special order it. Second: HALF THE COST! Whoohoo! So, I tried it with high hopes, I wanted to love it, but I am also a realist and so I tried it on a $10 fake wood entertainment center I bought off an online yard sale so if it failed, I wouldn't cry. Great news! The paint held up just like the chalk paint I have used for years! I used 2 coats, but I probably could have gotten away with 1 coat of the paint had I put forth more effort. I found 2 coats gives it a completely covered, smooth finish. I didn't sand, or do any prep work other than use a wet wipe to clean the piece. After the 2 coats, I let it dry for about 48 hours because life got busy and I didn't get back around to it. Waxing worked great! I a firm believer in a round wax brush. The wax is soft, super easy to apply, and the finish is smooth. I love a smooth finish on chalk painted furniture pieces. We actually got to try out the finish right away because my child spilled acrylic paint on the piece within 6 hours of me finishing it and it thankfully wiped right off. I did add some artistic knobs to the piece, but I am really happy with it! It's been about 2 weeks, and it is looking great. The products go on exactly like what you would expect from chalk paint and wax, the process and procedure for those of you who do this often, is exactly the same. The finished results are exactly the same between this and much more expensive chalk paint. I was extremely happily surprised and I will use this now as my go-to chalk paint for furniture pieces. Rated 1 out of 5 by ladydlk from Wax completely removes with damp cloth Painted a chest, dresser, and nightstand with chalk paint and finished with white wax. I loved the finished look, even though it was a bit of work. But I expected the work and followed the directions to the letter. To my surprise, days after completing the project a damp cloth completely removed the wax. No where on the wax labeling does it state that water will remove it. That is very important information to know. What if I had done a dining table, something that would be wiped down with water regularly.